This is special machine for the production of shopping bags (block bottom bags) with flat belt handle made of paper. The material can be paper roll or printed paper roll. Whole machine is controlled by computer central control system with touch screen and servo motor for cut-off length control. 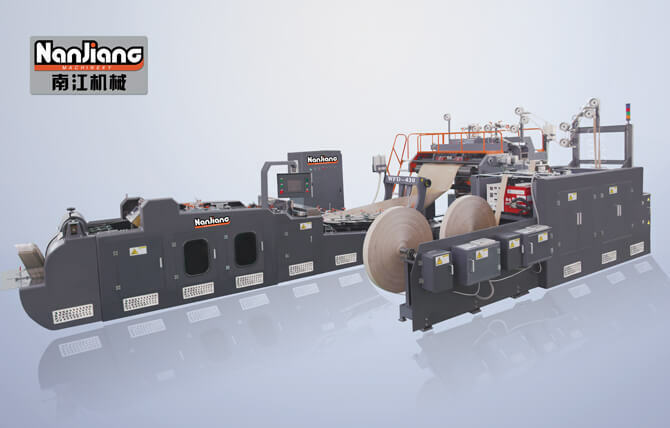 It can produce variable sizes paper bag and paste paper handle inline for completely paper bags without any manual process. 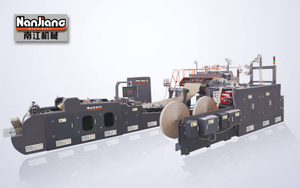 The machine automatic paper fed from roll, tube forming, cut-off, bottom forming, bottom glue, bag forming and final bag output. All steps are completed in-line; This machine is an idea equipment for Flat handle paper shopping bags. It is the quintessence both of home and abroad.